Absolutely stunning! Welcome to Seventh Heaven, a 7 bedroom 6 bathroom dream. Comfortably sleeping up to 16 + cot. 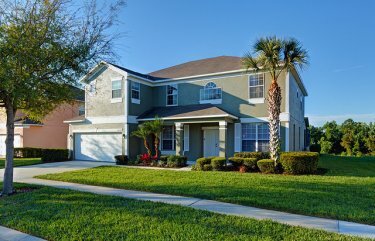 The location is perfect, a few minutes from the bustling 192, with it�s abundance of restaurants, shops, supermarkets and attractions, also just 2 miles from Disney�s doorstep and within close proximity to most other major Theme Parks. Situated within the prestigious and exclusive gated Emerald Island resort, with it�s 11 acre nature trail in the centre. Guests are permitted to use the clubhouse and it�s amenities free of charge, this includes a swimming pool, basketball, volleyball & tennis courts, games room, gym, sauna, internet room, bar and children�s playground etc� also plenty of golf courses to choose from nearby. 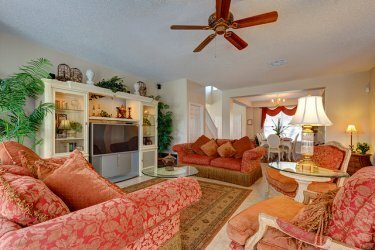 For those who require luxury executive style and comfort, this homes is second to none. The Grand Harbour is the most spacious of all the homes built within the exclusive Emerald Island resort, it boasts one of the largest south facing pool decks, so you can tan yourself on one of the many loungers, take a cool dip in the sparkling clear waters of the pool or relax in the 6 guest spa pool which overlooks the lake and conservation woodlands beyond. 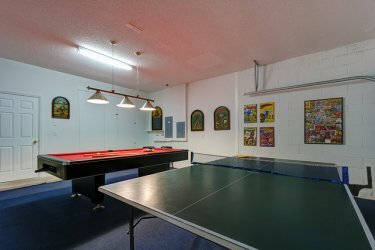 Let loose in the games room, enjoy a game of pool or table tennis or just lounge on the sumptuous couches watching cable TV, DVD�s or a Video on the 51 inch entertainment centre, don�t forget your favourite music, there�s a sound system too�.did I forget to mention the Play station & X-Box in the Disney room, and cable TV in every bedroom. As well as the furniture, the sleeping accommodation at Seventh Heaven is as you would expect - up scale and totally luxurious. No expense has been spared, to ensure your ultimate comfort. You can choose from 2 beautiful grand master suites with king-size beds, cable TV, walk in closets, en-suite bathrooms with his �n� hers vanity basins , walk in showers, corner roman baths, and toilets. There are 2 queen suites with queen-size beds, cable TV, spacious closets, 1 with a en-suite the other with a bathroom right next door. Each of the masters provides spacious and gracious, restful luxury accommodation, there are 2 very pretty twin rooms one with it�s own en-suite the other shares the �Jack & Jill� en-suite with the kids Disney bedroom. If you like to cook, you will find everything necessary in our fully equipped kitchen. Also for your convenience, washing machine/dryer/Ironing board and Iron�.and also hairdryers in most bathrooms. 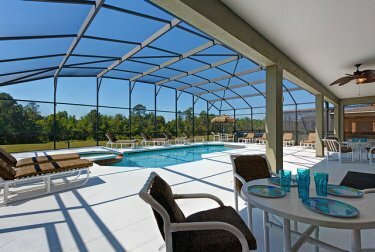 Pool Heating No Charge, Spa Heating �10.00 Per Day. Off deck barbecue for alfresco dining can be provided at a small extra cost.